Caveat: What Exactly Are They Selling? I was walking around my neighborhood yesterday, running errands, and noticed a new "Caffe Fuckaccia" (light blue sign). I wonder kind of café this is supposed to be - I didn't look closely. Yesterday, my students in my T2 middle-school class told me I needed to watch the cartoon called Phineas and Ferb, because of Perry the Platypus. "Teacher, you need to see that," they said. "It's important." In need of something mindless and escapist, I duly did so, and found it it pretty entertaining - it is pretty well-written for a children's cartoon. Perry the Platypus is a kind of James Bondesque superhero. There is an entertaining, vaguely central-European villain named Heinz Doofenshmirtz. In one episode (season 1, episode 18), one of the evil villain's colleagues asks, with respect to Perry the Platypus, "Does he have to come along?" Doofenshmirtz answers, "Yes, of course, he's my nemesis. I have to show him everything." I am feeling overwhelmed, even though it's Sunday, because next week - instead of being the "calm after the storm" of our talent show last week - is going to be a hellish week with a doubled teaching schedule. I thought I would feel happy when the show was over. Instead I felt angry and depressed. To the extent I was supposedly the show's manager, I felt the project was badly managed. So that's annoying. "No one to blame but myself," and all that. Perhaps the reason I so often resist being pushed into managerial roles is because I am incapable of deriving any sense of accomplishment - instead I pick apart what I've done and find the mistakes. I'm happiest as a worker drone, obviously, where I can feel a sense of accomplishment in surviving the mismanagement of others. I might go into a more detailed "post mortem" at some point. Or just move on and forget it. I will post some video of it, when it becomes available. There were no major disasters or failures - just A LOT of things that could have been done better, and a lot of unnecessary stress around all the small mistakes and failures. I hope the kids had fun. And I hope the parents weren't too annoyed. Anyway, I was exhausted last night and have to work today. You already know the answer to? Today is our show day for our annual talent show. Unlike last year, when my coworker Ken was the mastermind behind making it successful, this year (since Ken has left Karma) I've had to be more managerial and I'm not very happy with the result. I wasn't preemptive enough with various issues and concerns - I'm worried about the timing, which is important because of the bus-shuttle schedule for the students. And I didn't memorize my MC lines well, either. I think my students are better-prepared than I am. Here is a bucolic, summery picture I took walking to work the other day. A bicycle parked in front of a senior citizens' center in Hugok, with some flowers climbing behind. 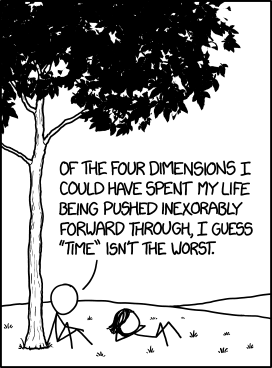 Caveat: Which Dimension Is Your Favorite? "Surely not" kills a person. Don't assume "it can't happen here." Be prepared for the worst. Never say never. This is interesting because the adverbial 설마 seems to have the subject particle attached to it, which seems to function as a kind of citational. It is definitely an example of the fluidity of grammatical categories in Korean. Should I prepare this for our talent show on Friday? Caveat: Wah Wah Wah... the power's going out! I had a bit of a happy minor milestone with Korean this morning. My building occasionally makes announcements over the intercom system. A few of these, in the past, I have learned to identify, mostly on the basis of keywords combined with the timing (each month's electricity bill delivery, for example, comes on a certain weekday near the end of the month). Mostly, however, I feel about these intercom announcements the way the peanuts kids feel about their teacher's talking. The sound quality is poor, and my command of Korean is lousy at best. It's just so much incomprehensible input. This morning, however, there was an announcement. It included the word for electricity, and it listed a specific time, and I was able to decipher it enough to realize: a) the power was going out, and b) I knew the exact times. I was thus able to actually plan my morning around this knowledge. Therefore, this represents the first time an intercom announcement influenced my behavior directly in a way closely connected to its intended meaning. That's what language is for. So ... I felt happy because of that. Korea doesn't have Memorial day on the last Monday in May. So today isn't Memorial Day, like it is in the US. But I get the day off anyway, because just coincidentally, the Buddha's birthday falls on this day, this year (it's calculated on the Lunar Calendar, so it moves around each year, like Easter or Chuseok). It's quite late this year. I am so exhausted from work, I have little motivation to do something "interesting" with my extra day off. I'm treating it as a bonus Sunday, meaning I'm trying not to pressure myself to do anything specific, and trying not to feel guilty about that. This is harder to do than to describe. I have been messing with my imaginary maps, a lot - including a lot of sketching and story-drafting. Maybe I'll post an update on that at some point. Meanwhile, here is something to listen to. What I'm listening to right now. Moderatto's cover of "Volver, Volver." For some reason I was struck, while surfing some map site, that my apartment is due west of Daly City, California - by... I'm not sure, maybe 8000 km? Why is this striking? Well, Daly City (and San Francisco, just to the north, and the redwood forests of San Mateo County, to the south) were fixtures of my childhood, and probably I still conjure images from those places on a near-daily basis, as my brain churns its always-evolving autobiography. I grew up in Humboldt, of course - about 300 miles north, at 40 degrees latitude. But my family made frequent road trips to the area just south of San Francisco that is now known as Silicon Valley. In the 1970s, during these family trips, it wasn't yet known in the popular culture as Silicon Valley, although it already was - Apple was already operating, HP was there (and I think my parents knew some people who worked there), NASA-Ames was churning out high tech projects, etc. I have very vivid memories of the stretch of highway 1 between the Golden Gate and Daly City, as it progresses down 19th Avenue, and crosses the city boundary from San Francisco at its southwest corner into the eerie, colorful ticky-tacky suburban homes of Daly City. To a hippie kid from "sticks" such as myself, I was rapt by the idea of the City (which was, exclusively, San Francisco during my early years). Anyway, I guess what's striking is that I make my home at the exact same latitude, on the opposite side of the Pacific. What would my 8-year-old self have made of the idea that at 50 I would be living so far away? The last two days have been truly exhausting and chaotic. Yesterday, especially - we had rehearsal for our talent show next week. We also had a partial power failure at hagwon. I got to teach classes in the dark. It was like a weird dream. I have a morbid habit, which I sometimes indulge. I read the blogs of people with cancer. These abound on the internet. More often than not, I come across pointers to such blogs in other places, in other contexts, but I will take a moment to add the pointer to a little pile (file) of links I have of "cancer blogs." Then, sometimes, when the mood strikes or I'm feeling mortal or hypochondriac or unlucky, I will read one. Many people seem to take the decision to start blog, upon learning they have cancer. I was different only in that I long ago started my blog as a coping mechanism to deal with different, unrelated issues (stepping away from my hermetic life and trying to document my efforts to jump-start my career). Perhaps I'm a bit different too, in that, since I was blogging before the cancer, now that I'm basically past it successfully (fingers crossed and knock on wood and all that), I continue blogging reliably - many "cancer" blogs "die" not just when their authors die, but also when their authors fail to die, but instead just get on with life. Recently a blog I've visited a few times (a linguist and thus someone whose non-cancer writings also had at least some appeal for me) announced the death of its author after a fairly short (6 month) battle. There, now I'm not feeling unlucky anymore. Andy Williams, "House of Bamboo." Called the House of Bamboo. It's a made of sticks. Dance the bolero in a sombrero. Shake - like a snake! You wanna drop in when the cats are hoppin'. That rocks - the juke-box! I have covered trolleyology before. Twice. I ran across this excellent satirical extension on the trolleyology theme, here. You have to have a certain philosophical bent to enjoy these, probably. Definitely, if you start to read them and don't understand what's going on, you need to first make sure you understand the background trolleyological tradition. But I definitely laughed at them. The other day, I was talking with my often mentioned student, Sophia, about her upcoming role as an assistent MC for our talent show. We were planning a kind of skit for a moment near the beginning of the show. In this context, I suggested she could interrupt me - which she does often enough. "...but, I can't be rude on purpose," she protested. I said, "You don't have to be rude. Just be your natural self." Without pause, she said, "But my natural self is ... quite rude." Then she made a funny face, realizing what she'd just admitted. There was apparently a bit of a scandal lately, over a small book of children's poetry that was published in Korea. It made it to the international press. Some of the poetry was apparently quite violent. The publisher was compelled to withdraw the publication, and remove unsold volumes from vendors. I guess this ended up as a kind of Streisand effect (q.v. ), and now everyone wants to see the book. I found some images online of some pages of the book, which I will reproduce below although I may take them down, as it might actually be a legally dubious move to show them. I really like the poem about the mom's hair - it is excellent. The cannibal doll is more scary, and I can see why parents found the idea of giving voice to such morbid (and confucianly-disrepectful!) poetry disturbing. But as a teacher of elementary students, I feel I can assert that such morbid thinking is common in children, and probably developmentally "normal." The place I live is called Ilsan. That's not actually the name of the city - the city is officially called Goyang, but Goyang is more like a consolidated city-county, in US terms, as there are several urban clusters with intervening agricultural land within its boundaries. There are two city districts (boroughs), West Ilsan (Ilsan-seo-gu) and East Ilsan (Ilsan-dong-gu) which together form the area informally known as Ilsan. The name Ilsan, itself, comes from the train station, I suspect, which is on the main northwest Gyeongui line (Gyeongui means "Capital-to-Sinuiju", Sinuiju being the city in the northwestern corner of North Korea - so this was the main rail line between Seoul and the Chinese border, prior to Korean partition in 1945). I remember actually spending time at the Ilsan train station in 1991, when I was garrisoned a few stops northwest of Ilsan at Camp Edwards, in the US Army. At that time, Ilsan was a village-like entity surrounding a single-room wooden structure that was labeled as Ilsan train station. Now, of course, "Ilsan" has half a million residents - it is one of Korea's most successful "new cities" (신도시 or planned cities). I'm writing about this because there seems to be some doubt as to where the name "Ilsan" comes from, even among Koreans. "Il" just means "one," so the name of the city is "One Mountain." But there is no mountain nearby called "Ilsan" - and most of Ilsan is pretty flat, actually, although just to the north there are some ridges and peaks in the area called Jungsan and Gobong, and within Ilsan there is a very low hill called Jeongbalsan, where I walk frequently, and on the northeast flank of Jeongbalsan is the Cancer Center. Both Gobong and Jeongbalsan seem like candidates for the "One Mountain" of the name, but I have decided that seems implausible. Neither of them are positioned quite right, relative to the train station that originally bore the name. On the other hand, a much more distant mountain, called Simhaksan, seems a likely candidate. On Saturday, on the pedestrian footbridge next to my work, which is a few blocks from Ilsan train station, I snapped this picture. Looking northwest along Ilsan Road, it shows clearly the single, noticeable peak of Simhaksan in the somewhat hazy distance, about 10 km down the road. I once went up Simhaksan, from whence you can see North Korea easily - basically it is the only mountain between Ilsan and North Korea, in that particular direction. That's definitely One Mountain, I thought. As many know, I still have some issues eating "normally." Aside from the fact that I don't have much sense of taste, which means that food just isn't as interesting as it used to be, I also have some issues around the fact that major portions of my tongue lack a sense of touch - it's permanently numb, like it will get after a visit to the dentist when local anaesthetic is used. This creates eating problems because it's surprising the extent to which we rely on our tongues to manipulate food in our mouths during the process of chewing and moving the food to the back of our mouths in preparation to swallow it. I can't always do this as easily or as successfully as I might hope. That is why my favorite foods now are the sort of soupy or sloppy things, pasta with sauces, soups, porridge, etc., that are "swallowable" without too much tongue movement. A month or so ago I bought a can of olives, because I like to chop them into my pastas sometimes. But I made a mistake - they were unpitted olives. I nearly threw them out, but in fact, I do like olives, and I can still enjoy the bitter/salty flavor of them somewhat. So I decided to try eating them. Things with seeds or pits or bones that end up in my mouth are things I normally dread - if you think about the gymnastics you do with your tongue when you find a watermelon seed or a fish bone, you will understand what I mean. But sitting at home, I would nibble around my olives and eventually I got brave and, looking at it as a kind of physical therapy, I would try to eat the olive and spit out the pit, in the "normal" way. It's kind of like forcing myself to do exercise that is unpleasant but hopefully good for me. I have this idea that I can build up my tongue coordination through diligence and practice. So I sit at my desk in the late mornings, with a bowl of unpitted olives, and exercise my tongue. It gets sore, on the tip, where there are still some nerve endings (which is what the doctors so miraculously saved, and which is why I am not handicapped in talking, for the most part, despite the loss of nerves in most of my tongue). Sihyeon said, "Teacher, do you like sociology?" We were doing a listening question in my TOEFL class, with a lecture on a sociology topic. "Sure. It's interesting, sometimes," I equivocated. "I don't like sociology," he stated, categorically. Continuing, quite serious-toned, he added, "I like sausages." In Korean accent, these two words have essentially the same initial sound. Did he think they were related? For some reason I laughed a little too long at this. The rest of the class time was not used very effectively. A few months ago, I missed mentioning the 50th anniversary of the assassination of Malcolm X, which was on February 21, 1965. It was one of those blog-posts I start to write but never finish. It seems apropos to think about it, however, in light of "Baltimore" and the many other events reflecting the dysfunction of racial and racialized politics in the US. I don't visit The Atlantic website on a daily basis, as I used to. At some point, I became fed up with the their constant efforts to pander to the lowest common denominator in the new internet-driven culture industry - so much in the same vein that I boycott the Facebook, I have been in a "soft boycott" (meaning not absolutist, but merely trying to avoid it for the most part) - I have stopped visiting The Atlantic website for the most part. Their recent reformats of their website were especially annoying, as it was all re-written to be "mobile-friendly" I guess, which is fine - but programming a website to have a "mobile" version and a "computer" version is technically trivial (well, not trivial, but certainly within the abilities of a competent IT department). So why "dumb down" one on my computer screen, too, making it more difficult to see all the different content they have? Oops, OK, that was a digression (or a rant). I was intending to write about Mr X.
I mentioned The Atlantic because there is one editor / blogger at The Atlantic whom I nevertheless seek out and read on a regular basis. That is the journalist Ta-Nehisi Coates. He recently mentioned Malcolm X in passing when discussing the way in which Obama's rhetoric on personal morality (of "people of color" - e.g. Baltimore) versus his rhetoric on issues of government policy forms a kind of "bait and switch." This is cogent and uncompromising reasoning - as is almost always my experience with Coates. Anyway, I will let you read his thoughts, here. However, Coates' mention caused me to revisit X's "The Ballot or the Bullet" speech from April, 1964. Some people might find it dissonant that Malcolm X is one of people whom I most admire in history. I am neither black, nor a muslim, nor a revolutionary. I am not, arguably, American anymore, either. Furthermore, I have strong philosophical opposition to nationalisms of all flavors, and there is no denying Malcolm X's nationalist bent. I think I admire him because he seemed devoid of hypocrisy and self-deception, which is possibly the human failing I most dislike - both in myself and in those around me. Malcolm X called out hypocrisy wherever he saw it. His was a righteous righteousness, therefore. It's possible, too, that I admire him as a rhetorician. Certainly now, when I am, in essence, a teacher of rhetoric (if you want to reframe middle-school EFL in as grandiose manner as possible), I am very conscious of and inspired by his control of the spoken word. Even before my current career, however, I was quite drawn to talented speakers. Regardless of why I admire him, I will merely conclude with an acknowledgement that I consider him one of the greatest Americans - something I've commented before on this blog, admittedly. Refrain from [believing] the report of the ears, but rather [believe] the report of the eyes. "Seeing is believing," of course. Then again, as a fan of (or, anyway, someone fascinated by) apophenia, sometimes we see things that are not there, and we choose to believe them, because our impulse to believe seems to epistemologically precede our sensory capacity. This guy is killing time. And apples. I was sitting in the staff room last night, busily completing my class logs and doing some essay editing, and Seyeong and Seunghyeon walked by about 20 minutes before the end of the last class. The two 9th grade girls popped their heads into the staffroom and said goodbye. "Why are you leaving early?" I asked, surprised. It's not common for one of the middle-school teachers to release kids early. The girls laughed and said in strange unison, "We are smart." I puzzled as to what this meant. At first, I interpreted it to mean that they had somehow cleverly escaped their teacher's clutches. If it had been some other student, this would have been the logical answer. But they are diligent students - this seemed unlikely. Instead, I decided they merely meant they had gotten some exceptionally good score on something, and thus the teacher had allowed them to go early. [... like] licking the skin of a watermelon. This seems to refer to the superficial enjoyment of something without knowledge of the deeper meaning. Googletranslate gives "scratch the surface" but I'm not sure that's quite exactly the same - "scratch the surface," to me, anyway, means something neutral, as in, just getting started digging into some topic (potentially negitive but also potentially positive). The Korean seems more definitely negative, to my perception, implying a kind of "failing to dig deeper." Weak from the noon-day heat. "Watch out, the potatoes are burning!" I smelled them ... then there was irresistible disgust. Unspeakable regret ... fumbling for the world again. When no soul may ever escape the eternal destiny of life? The poem is from The Spoon River Anthology, published 100 years ago this year. I came to these poems late (meaning I was never exposed to them, as far as I can remember, during my literary education. Nevertheless, I can understand why they are important landmarks in American literature. The other day, I had a student who really wanted to buy one of my alligator pencil cases (which I buy at the stationery store and sell to the students for alligator bucks). She ran away contentedly to play with it. When I saw her 2 hours later, she handed me the alligator pencil case. "I'm done with it," she explained. "I want my 50 dollars." "Wait a minute," I said. "You can't do that. Now it's used." I had to explain the concept of used. "Who's going to buy a used alligator pencil case?" I asked. In fact, Albert had managed to get noticeably dirty during his two hour fling. I pointed at the dirty white underside. She would have none of it. "I don't want it." After some debate, I finally agreed to give her a refund but with an "alligator rental fee" deducted, in the amount of 3 dollars. So I counted out a refund of 47 dollars. I wonder if this could be a business model, moving forward? Ha. The "surveillance state" is going to the dogs, now. The well-named municipality of Barking and Dagenham, in the UK, is going to be genetically testing dog poo and requiring pet owners to register their pets' DNA - this will allow unambiguous attribution of guilt to owners who don't clean up after their pets. How far we've come. This seems like one of those fake news snippets from a 1960s-era Heinlein novel. Really, though... could George Orwell have foreseen this? Informatik, "My True Love." The lyrics are stunningly banal - not what I would hope for from goth-rock. But whatever... I guess I like the sound of it. People think I'm weird because I don't seem to suffer from loneliness. Sometimes I feel gloomy or restless or bored, but I almost never experience loneliness. I make sure I get a good dose of sociality through my choice of career. And kids make better company than adults, in my opinion. They are "high intensity" social experiences, so you get lots of sociality in a short time. Then I can go home and be alone-but-not-lonely. "If you are lonely when you're alone, you are in bad company." - Jean-Paul Sartre. Ayer fue el cinco de mayo. Por eso me hice una celebración que incluyó no hacer nada pero hacerlo muy bien. Los Tucanes de Tijuana, "El tío borrachales." ni le hace la cruda. siempre anda de fiesta es mas que bohemio. Salud mis amigos por este momento. Arriba y abajo al centro y pa' dentro. Today is that peculiar Korean holiday, "Children's Day," which works ironically for teachers, since we don't work, and therefore do not see children on children's day, unless we have our own. I drew this on the whiteboard yesterday, with my trademark phrase. Home is where you're living. It means that living somewhere, it becomes home. "Home is where you hang your hat." Or, in Buckaroo Bonzai terms, "Wherever you go, there you are." This is highly relevant. I need to remember this when Koreans ask me where my home is. Scientists and inventors are doing things with neurons, wires and apps. The other day, I found this on the whiteboard of a classroom that I hadn't been in. One of my magnetic Minneapolitan rainbow monkeys, stuck on the whiteboard jesus-like, with a headline scrawled above him.